What time is sunset today? Or sunrise tomorrow? When is the "magic hour" next March 20 in Paris? 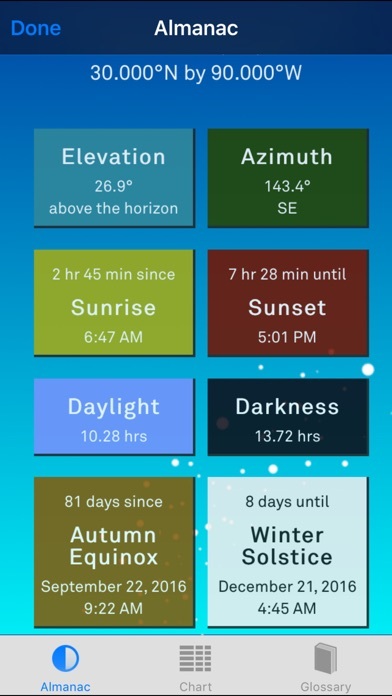 With Sol, you can check times and get reminders of solar events, at home or while traveling! Great for everyone looking to plan activities based on sunlight. Use it to remind you to walk the dog before dark, get up with the sun, or find golden hour time for that perfect photo. Sol: Sun Clock is the Swiss-army knife of sunlight tools with a design inspired by the simplicity of the sundial. Use it to plan your day, guide natural sleep cycles, get the best light for outdoor photography, make sure animals or kids are safe inside before dark, or to map out the best times to go running or fishing. * Be in tune: Sol will tell you when the golden hour is, how much sunlight you have left in the day or what time the next sunrise occurs. 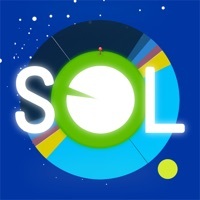 * Look to the future, travel around the world: Sol lets you find sunlight information for any date, anywhere on earth. 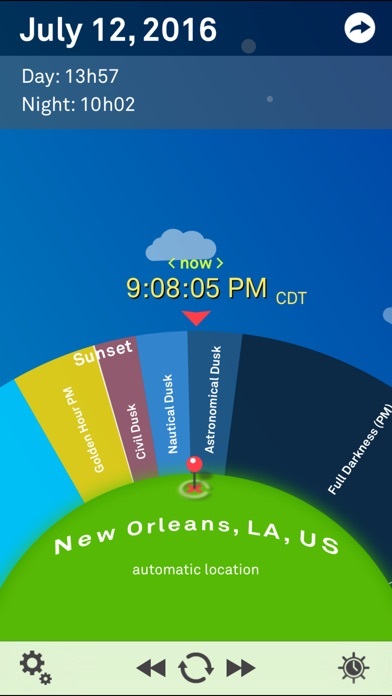 * Find solar midnight and solar noon, and all three twilight (dawn and dusk) periods: astronomical twilight, nautical twilight, and civil twilight. Keep tabs on the next solstice and equinox. 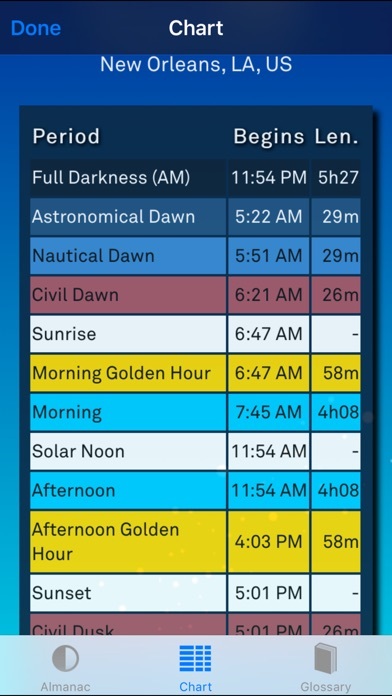 * Reminders and Alarms: Use Sol as a natural alarm clock that you can set to any event (like sunset, golden hour or solar noon), and the alarm or reminder time will adjust gradually as the days change with the seasons. 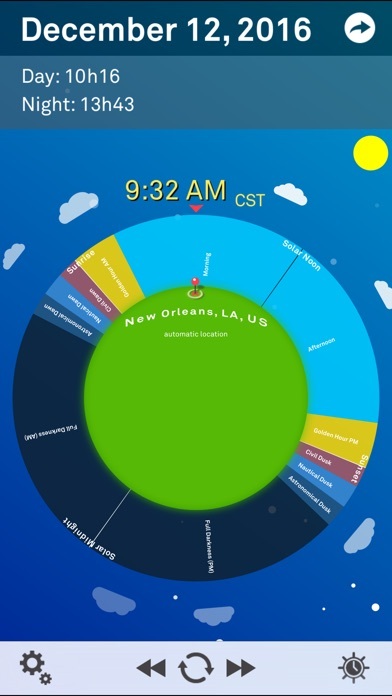 * Automatic Location: Sol not only calculates the amount of daylight and sunrise and sunset times, but does so for any location in the world (both Northern and Southern hemispheres) by using your device's GPS... no network connection required. * Other locations: Optionally, use the built-in map to choose any location in the world by moving the pin, or search using the name of any city. * Optional location-aware alarms. 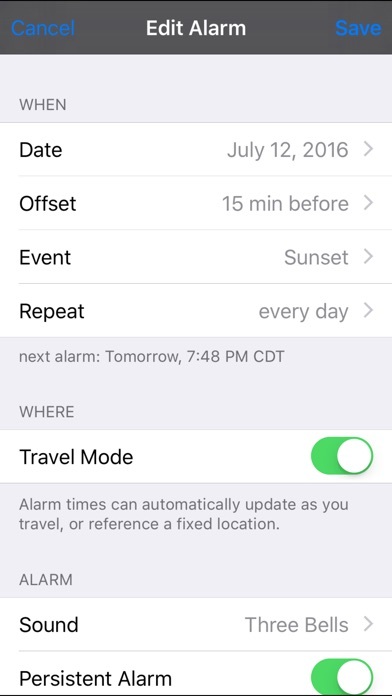 Sol knows when you change with your location; and as you travel it will adjust any alarms you set relative to sunrise and sunset times. Create alarms for multiple locations around the world. * Detailed almanac information: Useful information about the day's length, sun's azimuth and elevation, equinoxes and solstices, and a friendly glossary that explains all the terms. Note: Continued use of GPS running in the background can dramatically decrease battery life. However, GPS runs in the background ONLY if you have set location-aware alarms. I look at Sol daily, and I have all the notifications set. I find it to be very soothing, for some reason. Glad I found this: a really nice idea; very informative. This app is a regular of mine for years now. Excellent concept and well thought out in its design. I just slept through my Alarm!!! EVERY other alarm app works on mute. For sunrise to sunset fasting, and other alarms that are based on Solar time this needs to be a REAL alarm!! When DND is on or the phone is muted the alarm should still work. Every other third party alarm app works for this so somehow this needs to be changed. I use this for reminders about golden hour, and sunrise/sunset photography. I tend to run to the nearest window to look for a shot every time this app reminder goes off! I love it. 5 stars would be given, but I’m looking forward to “sub-solar moment” reminders if you are in the tropic latitudes, and upcoming eclipse reminders. I love this app! It’s like a little buddy who reminds me of things that are important. I can’t work in the dark, so I set it to remind me how much light is left, so I have time to roll up my gear. It also reminds me to shoot photos when the light is how I like it. So many spot-on great reviews. Get it! There’s nothing to lose. A very useful solar clock! Please add true sun-shadow gnomon! A very useful solar clock, please add true sun-shadow gnomon! The sun-sync alarms helps me go out for a hike or walk at the best times of day. The only thing missing is an electronic sundial, the true length of a shadow! A sun-shadow gnomon would make a really useful visual display. The gnomon's shadow would show both the solar azimuth and elevation, dynamically and with elegant simplicity, graphical indication of the shadow length for any time during the day. Please put a gnomon and a shadow in the middle of the circle. The static shadow is misleading. Also, please let me set any specific sun elevation angle, up to 45 degrees, instead of limiting me to 20 degrees for golden hour. Sol. Solar timepiece for iPad. ☀☀☀☀☀ 5 stars. ≡≡≡ 9/9/2016. Seems to stop producing banner sometimes. After several days, it seems to stop producing the banner. As soon as I open the app, it stars again and is good for several mire days.